Many things are about going green these days, as devastation hits our planet daily, many of us are now making eco-living an essential part of our lives. Which is why we launched our first eco-wood kitchen collection named ‘Elegance’ into all the Kütchenhaus kitchen showrooms. The Elegance range, which comes in a choice of Oak or Walnut, has been a huge hit with customers since its launch, due to it being made of 100% sustainable forestry. Our entire 2011 kitchen range now conforms to PEFC, which means for the first time we have been able to introduce a pure wood kitchen, secure in the knowledge that the oak used, only comes from PEFC approved sources. 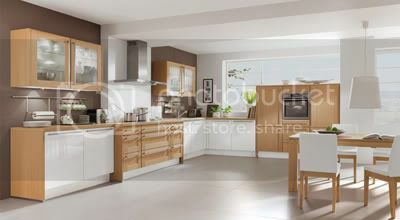 Anyone who chooses the Elegance kitchen for its eco-credentials, in no-way has to compromise on style or price. In-fact the new kitchen is one of the most popular choices in the new collection and priced at £10,000, it is an extremely affordable selection. Like all Kütchenhaus fitted kitchens, the Elegance door fronts can be mixed and matched with any other style from the Kütchenhaus portfolio to create something original and fresh for every home. The kitchen seen here is the new Elegance mixed with a fresh-white, high gloss door front to create a wood kitchen with a contemporary twist. Here at Kütchenhaus we are highly trained to offer lots of style combinations ensuring every kitchen is unique to each customer and at no extra cost.